The 12th edition of the Austrian Cycling Summit is going to take place in Graz from May 27th to 29th 2019 under the general motto „cycling.connects”. 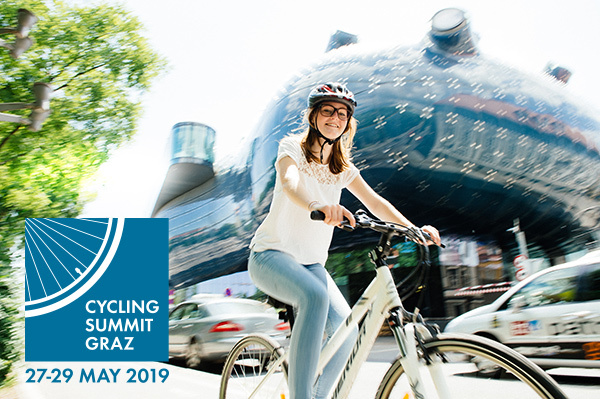 The Styrian cycling capital Graz invites you to participate and exchange know-how and experience with national and international experts during these three days. You will be awaited with an exciting program including over 50 interesting sessions, workshops and attractive side events. This year’s keynote speeches focus on urban cycling – what connects different cycling cities, what distinguishes them from each other, and what conclusions can be drawn of it? Graz, Ljubljana (SLO) and Groningen (NL) – three cities with similar framework conditions regarding inhabitants, urban area, and topography – take noticeably different approaches when it comes to preparing suitable conditions for bicycle transport. Insights into the past, present, and future of these cities combined with a thematic excursion into the surroundings – the cities’ regions. In addition, a bicycle-theft-prohibition-workshop of the Urban Mobility Lab Graz, the Expo-area with a variety of exhibition booths of cycling-related companies and initiatives, as well as the poster / balloon session offers plenty of possibilities for knowledge exchange and networking. On Monday the 27th of May a startup workshop of City Changer Cargobike provides valuable insights to specific business models for cargo bikes. Another highlight of this year’s Cycling Summit is the cooperation with “CityRadeln Graz”, a cycling parade through the city of Graz, finishing with a great cyclists’ party in the famous cavernous venue “Dom im Berg”. On Wednesday the 29th of May in the afternoon interesting excursions invite to explore the local peculiarities and characteristics of Graz from a cyclist’s point of view. Have a look at the varied programme and secure your personal ticket for the cycling summit here (limited number of participants)! The Austrian Cycling Summit 2019 is hosted by the City of Graz and the Province of Styria in cooperation with the Federal Climate Protection Agency, klimaaktiv mobil from the Austrian Ministry of Sustainability and Tourism, and the Austrian Ministry for Transport, Innovation and Technology.